Luminous lips, captivating brillance. For soft lips... Fall in love with our Lip Care Stick. Our formula is enriched with Beeswax and Shea Butter, known for their nourishing and moisturizing properties. 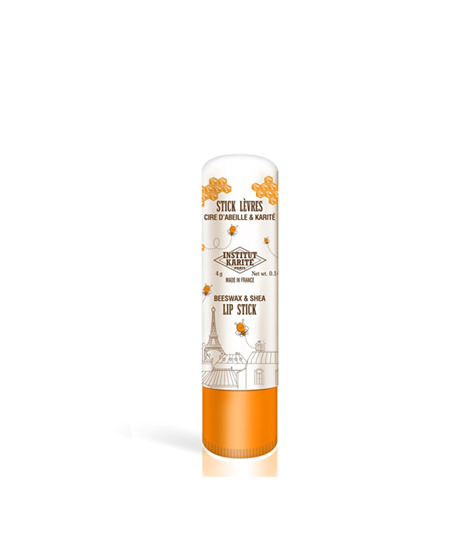 A product specially designed to enhance your lips' beauty. The sweet and delicate notes of Vanilla will make you live a unique sensory experience. 81% of ingredients of plant origin. Discover a rich and nourishing texture to moisturize your lips. Apply daily as often as required. INGREDIENTS : PARAFFINUM LIQUIDUM / MINERAL OIL / HUILE MINERALE, OZOKERITE, PARAFFIN, CERA ALBA / BEESWAX / CIRE D’ABEILLE, ISOPROPYL MYRISTATE, BUTYROSPERMUM PARKII (SHEA) BUTTER, CETYL PALMITATE, ETHYLHEXYL METHOXYCINNAMATE (OCTINOXATE), CANDELILLA CERA / EUPHORBIA CERIFERA (CANDELILLA) WAX /CIRE DE CANDELILLA, PROPYLENE GLYCOL DICAPRYLATE/DICAPRATE, PRUNUS ARMENIACA (APRICOT) KERNEL OIL, CALENDULA OFFICINALIS FLOWER EXTRACT, ARNICA MONTANA FLOWER EXTRACT, TOCOPHEROL, RICINUS COMMUNIS (CASTOR) SEED OIL, HELIANTHUS ANNUUS (SUNFLOWER) SEED OIL, PARFUM (FRAGRANCE), SOYBEAN GLYCERIDES, POLYHYDROXYSTEARIC ACID, BHT, CI 77891 (TITANIUM DIOXIDE).